Install your HTML email signature in Spark on MacOS no time! This article includes our easy step by step HTML email signature install guide, screenshots, videos and troubleshooting FAQ. It's never been easier to create a new email signature for Spark Mail on MacOS. Check out our beautiful email signature templates and easy to manage email signature software, that makes creating email signatures for Spark a breeze. Make sure you have your html email signature file open in Google Chrome or Mozilla Firefox. If you run into any issues during your HTML email signature installation in Spark, please see the Troubleshooting FAQ for frequently asked questions, before contacting support through your member account. Open your email signature in Google Chrome or Mozilla Firefox. If you're logged into your Email Signature Rescue account then you can view your email signature in Full Screen Preview. IMPORTANT: Use only the Google Chrome or Mozilla Firefox web browser. Do not use the Safari web browser to copy your email signature from as there is a bug in Safari that will cause your images to stack vertically. Now that your email signature is open in a new window, press Cmd + A to highlight the signature, then press Cmd + C to copy the signature. NOTE: Do not use your mouse to highlight your signature, use the key command. Using your mouse may result in you missing out on some code which will cause issues with formatting. 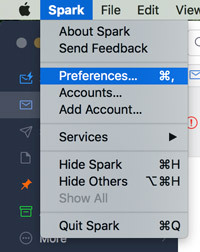 Switch to Spark Mail and from the toolbar select Spark > Preferences. From the Preferences window you will see tabs listed across the top, select Signatures. On the left hand side you will find your signature list. Click the + icon at the bottom to add a new signature. Click inside the signature window and press Cmd + V to paste your copied email signature. Now that your signature has been pasted, click the Default for button and select your email account. If you have tried our Written Instructions for installing your signature into Spark Mail App and you run into any issues, please read through this troubleshooting guide before contacting Support for further help. Troubleshooting: Where do I find my HTML email signature file? Where do I find my HTML email signature file? If you don't have an email signature key or HTML file, consider joining Email Signature Rescue now and get creating! We offer over 30 professionally designed and tested email signature templates, tools and features to create and manage your email signatures online and a whole lot more.